Published in the February 2012 NAWCC Bulletin, starting on page 65. It is a good idea, when servicing any weight-driven clock, to remove the gear from the winding drum arbor so you can restore all of the pivots on the winding arbor. When servicing a Vienna Regulator mechanism I always remove the gear, and then remove the spring, and the pawl from the gear before cleaning the parts in cleaning solution. I then stone and burnish all of the bearing surfaces on the arbor – including the section of the arbor on which the gear rides. 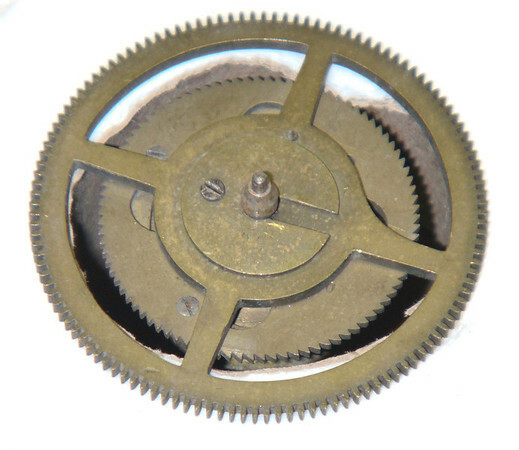 While removing the gear is often a fairly straight forward proposition, the mechanisms made in Vienna tend to be not quite so simplistic, at least at first glance. The gears for both German and Viennese winding drums are typically held onto the arbor by a slotted washer. While many of the German factory-made Vienna-style mechanisms use a screw to retain these slotted washers (see Figure 1), the Viennese recessed these pesky little washers into the gear (Figure 2). The first time you see one you might just decided you don’t need to take it apart. None the less, with the simple technique that is the first subject of this Tid-Bit, you too will be able to laugh at this technical challenge and slip the washer right out!